Perhaps you are a beginner looking for a low-cost racket to get started… or maybe you are a casual player looking for something nice but cheap. It does not really matter, because the Yonex Nanoray 20 will bring you exactly what you are looking regardless of the kind of player you are. Even though it’s cheap, it’s packed with plenty of value and very interesting features that will draw a smile on your face and help you to score many points, and of course, win many games too. Let’s check the advantages and disadvantages. Excellent repulsion power. It’s fast and powerful in this aspect. Excellent for beginners. Especially if you are an attacker. Fast and effective. It cuts fast and easily through air thanks to its design. If you are looking for a budget-friendly racket that’s also good for beginners, then this racket is all you need. It’s well-rounded in most aspects, but in shines when it comes to attacking due to its excellent repulsion power, great aerodynamic design and fast head speed. 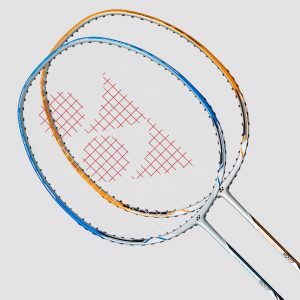 Want to know more about the Yonex Nanoray 20? Then come with me and learn more about it. In terms of aesthetics it looks good, pretty much the same as the Nanoray 10. It looks cool, it won’t make you speechless about how beautiful it is, but it looks decent. It’s very similar to the Nanoray 10, but it includes the incredible Aero-box Variframe technology. Excellent repulsion power. If you want to get such an important feature, then thanks to the Nanomesh + Carbon Nanotube you will get so. Great power. It doesn’t come to the performance of Voltric 80 or Voltric Z Force II, but for the price it does a good job. You will see its good performance with clears and smashes. Aerodynamic to cut through air. The contouring at the top of the frame reduces air resistance, so you can cut through air without problems. This will allow you to achieve more power and speed with every single hit. Less torque. The Aero-box Variframe technology along with the built-in T-joint will reduce torque, and in return, bring you more accuracy for more successful shuttle placements. Great handling and top-notch maneuverability. This racquet is pretty light and thanks to the design and the control support cap, handling it is very easy and brings you top-notch maneuverability for a better performance. Finally, the isometric frame shape will bring you an enlarged sweet spot, which is perfect for landing more successful shots. This, along with the rest of features, will make it easy for you to score points. This feature makes it even better for beginners. When we talk about affordable badminton rackets, we usually think they are expensive, and in fact most of them are. But the Nanoray 20 is a cost-effective option which is perfect for beginners who don’t want to spend a fortune. It feels great the hour of serving, as you can send the shuttle far without problems. Moreover, the placement is very accurate most of the time. It will be hard to miss with this racquet. If a racket cannot throw good clears, then it’s bad in all senses. Fortunately, the Nanoray 20 throws pretty good clears that will go far and without effort from your part, all thanks to the quick swing. You should not expect very strong smashes, because you would need a heavy-head racket for that. Although, the smashes are decent enough for a good game, especially if you are a beginner. The fast swing and aero-box Variframe will allow you to cut through the air easily, and hence, help you to generate more power. Just like the Nanoray 10, it will help you to throw sharp and accurate drives, especially in terms of defense. Once again, thanks to the incredible maneuverability and superb gripping. Forehand and backhand drives are great with this racket. The lifts are pretty good, which allows you to block several attacks without problems. This racket offers you a nice way to experiment with your defensive skills. Cheap, fast and powerful. These are the characteristics that better define the Nanoray 20. It’s a wonderful choice for beginners because it is very easy to use and it’s well-rounded in attack and defense. It’d make an excellent first racquet for you!